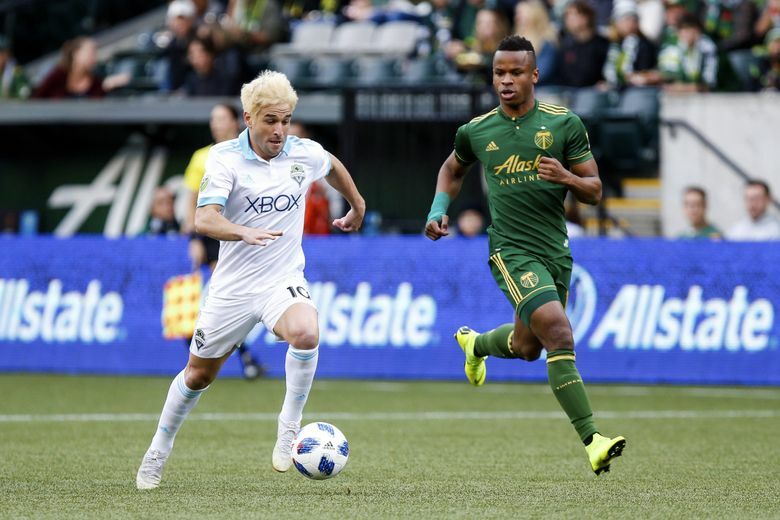 Halfway through the second round of Major League Soccer playoffs, the Sounders are already contributing to a familiar storyline of the regular season meaning too little. They head into Thursday’s second leg of the Western Conference semifinal against the Portland Timbers at CenturyLink Field facing elimination and minus injured MLS Defender of the Year candidate Chad Marshall and very likely without midfielder Cristian Roldan. Of four conference semifinalists coming off first-round byes, the Sounders and New York Red Bulls both trail and risk being ousted by lower-seeded squads – which would maintain the 50 percent ratio that’s happened since the opening Knockout Round playoff format was introduced in 2011. Critics have long contended MLS doesn’t reward teams enough for a strong regular season; amplified by higher-seeded sides being forced to play two-leg conference semifinal series in which they open on the road against Knockout Round survivors. Sounders midfielder Harry Shipp, who will almost certainly replace Roldan on Thursday, isn’t sure whether he’d prefer starting these series at home or on the road. The Sounders did score a key away goal in Sunday’s 2-1 defeat. Away goals are the first tiebreaker in the aggregate series, meaning the Sounders could advance with a 1-0 victory. “Scoring that away goal and only being down one in deficit, I feel like we’re in a pretty good spot to either win the game 1-0 or hopefully put two or three on the board and keep them off the scoreboard,’’ Shipp said. That away goal could play a factor if the Sounders and Stefan Frei — who narrowly lost MLS Goalkeeper of the Year honors to Zack Steffen of the Columbus Crew on Tuesday — shut down the Timbers from here. Still, the fact remains the No. 2 seed Sounders will be eliminated if they don’t score. No. 5 seed Portland advances with a victory or a draw, or even a one-goal loss in a 3-2 or higher-scoring game because they would have more away goals. If the Sounders win 2-1, the series would be tied on away goals and move to the next tiebreaker – a pair of 15-minute overtime halves. After that, if still tied, penalty kicks will decide it. And for many, that’s too lenient on the lower-seeded teams. There has been a push for the league to scuttle the away-goals tiebreaker and simply award any tied aggregate series to the higher seed to make the regular-season results more meaningful. Others want the two-leg series changed to a single-elimination knockout format throughout, like in the NFL, with the higher seed playing at home. The current format sees single-elimination games in the opening Knockout Round, two–leg series in the conference semifinals and finals and then back to a one-game showdown in the MLS Cup final. Going with single elimination all the way through would likely favor higher-seeded teams. Since 2011, they’ve gone 24-11 (.686) in single-elimination games – including MLS Cup finals — compared to 21-19 (.525) in all two-leg conference semifinals and finals. The conference-semifinal format currently provides almost no higher-seed advantage, when rested-but-sometimes-rusty teams coming off byes must open on the road against lower seeds riding momentum from winning their Knockout Round matches days earlier. Bye teams are 7-11-6 in 24 conference-semifinal road openers against lower-seeded teams since 2011 and just 10-10 overall in those series, pending this year’s results. Moving to single-elimination throughout would also shorten the playoffs to avoid the mid-November FIFA international break that slows momentum and fan interest. But MLS owners tend to like two-leg series, which guarantee each team a home gate. If the Sounders sell 45,000 tickets at an average of $35 each for Thursday’s game, that’s nearly $1.6 million in gross revenue. Sounders coach Brian Schmetzer said defender Marshall won’t play Thursday after undergoing surgery Tuesday to repair a torn meniscus in his right knee. Though Schmetzer wouldn’t speculate on a return, it typically takes a month to recover from such surgery — meaning Marshall wouldn’t play again until the MLS Cup final or possibly the second leg of a conference final if he pushes things. Roldan has a right hip flexor strain and Schmetzer left open the remote possibility he’d play Thursday. But in answering a separate line of media questioning about Roldan later on, Schmetzer told reporters “We’ll miss him’’ and sounded like he already planned not to use the midfielder. Schmetzer said his players know they need to score and win. He’ll caution about leaving themselves vulnerable to counterattacks, but expects a typical home game where they take charge. Shipp said he doesn’t think the Sounders will feel too much extra pressure. The last time they trailed in a two-leg series was last February against Santa Tecla FC in CONCACAF Champions League play, losing the road opener 2-1 and then rallying for a 4-0 series-clinching win at home.